Ah, is there nothing finer after a day in the snow than curling up on the sofa with a hot cup of cocoa? 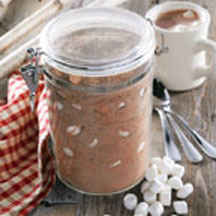 For 2 Quart Jar: Combine dry milk, sugar, cocoa and marshmallows in large bowl. Pour into 2-quart jar or other suitable container. Seal with lid and decorate with fabric and ribbon. Recipe To Attach: Measure 1/2 cup cocoa mix into mug. Stir in 1 cup boiling water. Makes 12 servings. For Pint Jar: Combine dry milk, sugar, cocoa and marshmallows in large bowl. Pour into pint jar or other suitable container. Seal with lid and decorate with fabric and ribbon. Recipe To Attach: Measure 1/2 cup cocoa mix into mug. Stir in 1 cup hot water or milk. Makes 4 servings. Makes 12 (or 4) servings.